Happy Thursday....Yep Thursday. I know I don't normally post Thursdays but I made this card and wanted to share...It was inspired by one I saw on Pinterest. 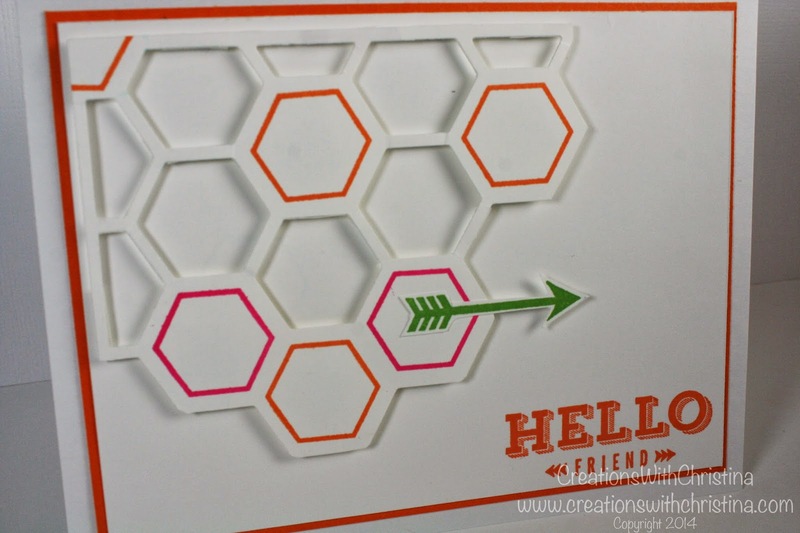 I used the Hexagon Hives Die with some whisper white card stock to create the top layer. Sometimes I feel I need to use products just the way they are. I need to learn to think outside the box...like only using a section of the die cut instead of the whole thing. Thanks for stopping by today. I hope you enjoyed today's project. Just a reminder. Sale-A-Brations is ending Monday. Don't miss out on some free products when you spend $50. This is neat! I love the die-cut, and I would never have thought to combine Pumpkin Pie with Melon Mambo, but it looks great. Thank you. BethAnn M.
Fantastic card! I need to think more outside the box too! !